If you want to exceed your grasp, there’s probably an app for that. In a time where technology is woven in the familiar cloth of our daily lives, it’s not implausible to imagine a time, say 2062, where the essence of a person can persist long after the body is gone. Marjorie Prime (at Marin Theatre Company until May 27) begins with a scenario that is all too familiar to many people: caring for an aging parent whose memory and faculties are fading. In a sparse, office-like living room sits Marjorie, an 86-year-old woman. She faces a crisply-suited, handsome young man perched on the couch. They engage in a simple and predictable conversation that seems to comfort Marjorie while at the same time confusing her. The young man is Walter Prime, a digitally-created derivative of her late husband Walter when he was in his handsome prime, bought by Marjorie’s daughter Tess and her husband Jon in an effort to assuage Marjorie's grief as well as to lighten the load of caretaking. 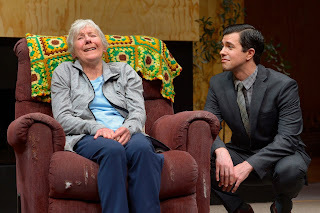 Joy Carlin is adept at playing aging, frail and somewhat confused Marjorie as well as the precise and curious Marjorie Prime, with subtle differences in stance, movement and speech. Tommy Goorebeeck conveys the paradox of a caring but detached digital presence, his machine learning skills activated to absorb as much data about Walter as possible. Walter Prime exercises Marjorie’s recall of past events and reminds her to perform activities of daily living, such as eating a tablespoon of peanut butter. He is humanoid enough to irk Tess, who seems to resent his ability to engage Marjorie in ways she cannot. Tess is conflicted internally and externally, a middle-aged woman dealing with her own demons and fears, powerfully played by Julie Eccles. Her husband Jon, patiently portrayed by Anthony Fusco, tries to be supportive of Tess as well as Marjorie but is caught in the middle of problem solving and disappointing reality. Marjorie’s death is subtly implied, and her space is filled by Marjorie Prime, commissioned by Jon to help Tess through her pain and disconnectedness. Like Walter Prime, Marjorie Prime seems perfect but not enough to keep Tess from the darkness that grips her. Marjorie Prime explores an eerie but beautiful projection into a timeless, spaceless dimension where digital entities can continue to converse in their finite loops. 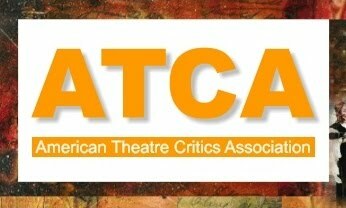 The passage of time in this play happens in the blink of an eye, and you realize that you have journeyed to a time without space and time. 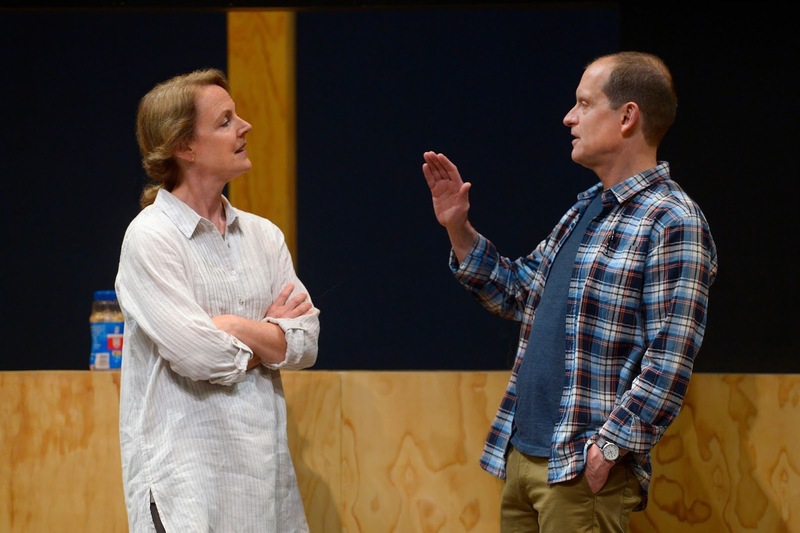 MTC’s Marjorie Prime takes us on an important journey through the stages of human grief and the reality that even with slick technology, we cannot escape our human condition. 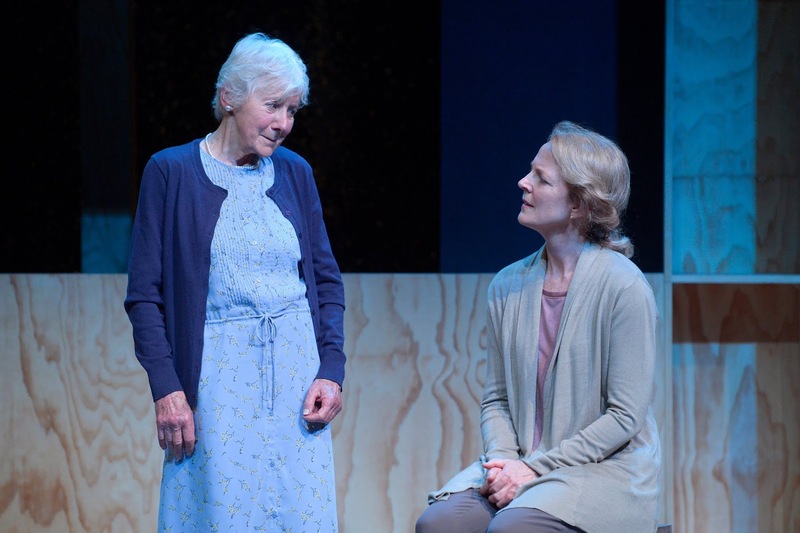 Marin Theatre Company always goes the extra distance is expanding the spheres of the plays they produce; with Marjorie Prime, the lobby is full of interesting, educational and interactive exhibits about memory, dementia, caregiving, and memory. Try to catch this show before it ends May 27. Christine Okon. Simple theme. Powered by Blogger.